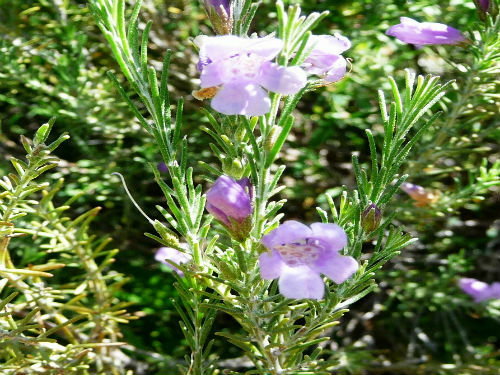 Eremophila microtheca is a small, compact shrub reaching a height of 1.5 metres with a similar spread. Leaves are fine, narrow, hairy when young and becoming hairless with age. Foliage gives off an odour, when crushed, which may be objectionable to some gardeners. The answer to this problem is to plant away from paths and other places where there is a chance of brushing against the foliage. Flowers are flattened tubes in shape. They bear a superficial appearance to the blooms of Prostantheras and Westringias. Their colour ranges from blue to purple. One flower is held in each leaf axil. Blooms are carried from late spring to early summer. Tip prune occasionally. E. microtheca is a hardy shrub that could be incorporated, away from the edge, into native garden beds. E. microtheca is found in the coastal regions of Western Australia. The species name is from the Greek: micro, small and theca, case or container and refers to the small fruit. 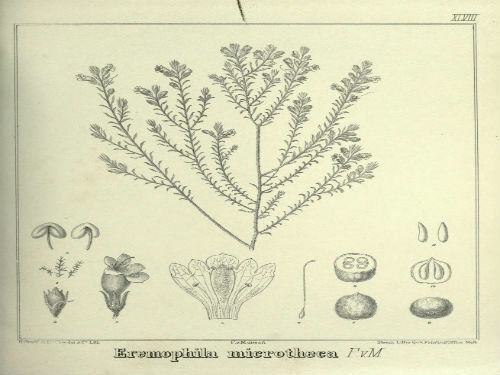 The type was collected at Port Gregory, Murchison River originally known as Pholidia microtheca and named in 1870. The second image is an early drawing, of the species, by Baron von Mueller.